Foreign investors considering the Vietnamese market are often drawn by its competitive costs. Vietnam’s low wages have traditionally provided these cost savings; however, the country has also quietly developed one of the most competitive tax regimes thorough Southeast Asia. 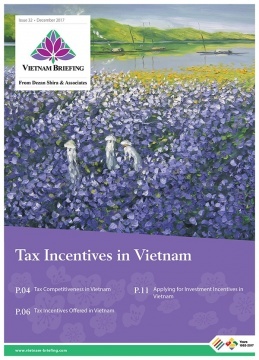 Vietnam’s tax incentives are a standout feature of the tax regime, and are applied to a variety of industries and projects throughout the country. Vietnam’s tax incentives, while attractive on paper, can present challenges to investors unfamiliar with the country’s legal system. Foreign investors keen on investing in Vietnam and securing investment incentives must be sure to understand the incentives that Vietnam currently offers, which will provide the best saving for them over the duration of their project, and the requirements that they will face when apply for these incentives. Dezan Shira & Associates has a growing team of pre market entry and tax specialists throughout Vietnam, providing our clients with years of combined experience assisting foreign enterprises to navigate the nuances of the Vietnamese market and select optimal structures to reduce their costs. Please contact us with any questions on tax liabilities, eligibility of specific business lines for tax incentives, and tax incentive applications.